two children under the age of 3? 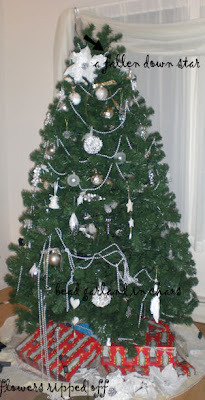 and I still wanted to have my "elegant-no-touch" tree? yeah right, I've learned....see what they've done? Oh dear.. I didn't get the chance for a BEFORE pic of my chrissy tree this year..
Before involved NO CAT.. he attacks it on a daily basis.. has even been known to climb french doors and reach out with his wee kitty paws to attack higher branches! Never mind - it's a wonderful family tree. Your Christmas tree looks aewsome in flash. 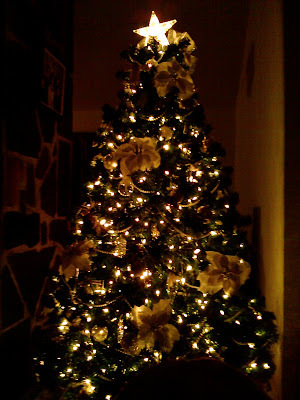 Your tree looks lovely in the light and in the dark! I imagine festive trees are quite a temptation for toddlers, LOL! With so much color and texture, it's no wonder. Wishing you a Merry Christmas and Happy New Year!